United Fire Group Announces AASP Dividend, Membership Pays – Literally! 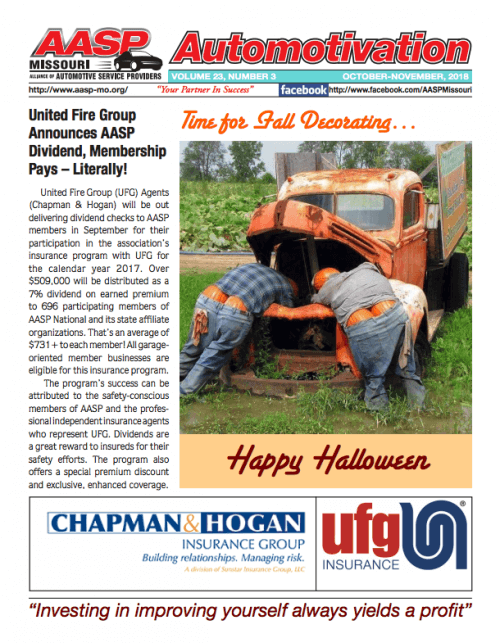 United Fire Group (UFG) Agents (Chapman & Hogan) will be out delivering dividend checks to AASP members in September for their participation in the association’s insurance program with UFG for the calendar year 2017. Over $509,000 will be distributed as a 7% dividend on earned premium to 696 participating members of AASP National and its state affiliate organizations. That’s an average of $731+ to each member!All garageoriented member businesses are eligible for this insurance program. The program’s success can be attributed to the safety-conscious members of AASP and the professional independent insurance agents who represent UFG. Dividends are a great reward to insureds for their safety efforts. The program also offers a special premium discount and exclusive, enhanced coverage.